Recorded at Polaris London, August - September 1999. Couldn't agree more with fabriknos (nice to see you're still on the case, mate, still like "Living by Air"). Just have listened to Empires for the first time in several years and I am blown away by it yet again. Advance and Follow was a good start, Praise the Fallen was a hell of an album, but Empires (and all its ancillary releases Burning Empires, Standing EP, Darkangel with it) embody the very pinnacle of what VNV have been capable of. Yes, unfortunately it is "have been capable of", as after this phase of extreme creativity, power, and emotion, things went downhill. Beloved was good but not as good, and Future Perfect breathed out the last of what made VNV a great underground band. Now we are forced to listen to flat sounds and meaningless lyrics, and just annoyingly geeky-sounding half-baked techno-pop cross-overs. I only have a sorry smile for all those who think that songs like "Illusion" are great achievements. It's weak, it's flat, it's devoid of emotion. VNV are making music now for Generation Y douches and Millenials weaklings. I lament that the full sounds of Empires have gone. I lament that the great emotions that have gone. There is the anger in the lyrics of songs like "Kingdom" ("My will be done/Until that kingdom has been won!") and "DarkAngel" ("I'm in the mood because of scorn/I'm in a mood for total war!"). And there is the purity and goodness of "Legion" ("Despite the wisdom of defeat/I bore my heart for all to see/the wonders I'd seen"). And there is the calm, the assurance that gives strength, in "Lastlight" ("Forget your fears/and want no more"). And standing out from all those great songs is "Saviour", which - with and without lyrics - is hands-down the BEST song that ever came from VNV Nation. There is no better way to motivate me to become a better me, to take every day as a challenge to surpass my yesterday's efforts, to draw strength from Ronan's words and from the music that is sending shivers down my spine, than listening to Empires. Because that is what Empires does, with each and every song, it motivates me to do things, to be aggressive, to seek out my boundaries and surpass them. I wish Ronan would find his path back to the place where Empires was born, and forget about almost all the stuff that came afterwards. Goddamn, not one review of Empires yet? What is wrong with this world?! OK, everyone in the industrial/goth world knows about VNV and Empires, but something still needs to be said about this album. 1999 was a year when electronic music was in flux - techno was entering the mainstream, trance had been commercialized beyond all redemption, and industrial/ebm had deteriorated into a boring, derivative sludge of mediocrity. 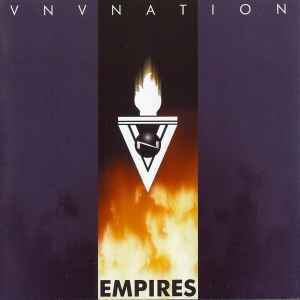 A few artists kept their heads above water during this time, but not many; VNV was one of them, and Empires is without a doubt their most enduring and memorable release. First and most importantly, the album works as a whole. It's not just a collection of random tracks thrown together to make an album. It is a kind of story that unfolds over time, and while each track can - and does - stand on its own, it's really how they all work together that is the beauty here. Phew... here we go. Firstlight is a perfect introduction to what will be an intense, emotional ride. Chill and dark, hinting at things to come. Kingdom takes over with a harsh industrial breakbeat vibe, and Rubicon follows up with an incessant energy that literally could go on forever if it wanted (I'd be OK with that). It's Saviour where things get amped up. Even without vocals, it is one of the most powerful VNV songs ever made, and all of a sudden you realize you are being rushed along at a breakneck pace into uncharted territory. Think it can't get any better? After Saviour's incredible turning point, now you're full on into industrial-techno mayhem with Fragments. Absolutely unforgiving and relentless. Then suddenly, there's a sad interlude in Distant (Rubicon II). The energy subsides, and then the dark clouds truly disperse with Standing - one of the more moving VNV tracks, and for sure one of the most memorable tracks on the album (as if there weren't enough already). Once Standing leaves its imprint on you, Legion takes you right back into the dark and demanding sounds introduced in the beginning. Another all time great VNV track, but somehow, there's yet another massive track right behind it: Darkangel. This album is literally classic after classic! Once the epic climax of Darkangel subsides, Arclight takes us full circle back to the dark, tenative sounds we heard on Firstlight, this time with Ronan joining in with his voice. Then the ride is over... What do you mean it's over? What just happened? Why can't this continue?! That is what you're going to ask yourself after listening to Empires from start to finish. VNV produced plenty of badass, hard hitting EBM before this. But Empires saw a progression into a truly distinctive melodic style, while maintaining the sharp and cold edge of their previous work. This was the moment where both worlds collided perfectly and without one overtaking the other. After this, VNV would go into more of a trance/futurepop direction. But Empires still stands (no pun intended) as the crown jewel of what VNV Nation embodied: dark and energetic music, bittersweet lyrics, and an epic, almost otherworldly aspiration that you can't help but be inspired by. If you don't own this, do - it is one of the best things to come out of the 90s industrial scene, and in my mind the best thing to come out of VNV, period.